Compare and measure students' electrocardiogram (EKG/ECG) waveforms. 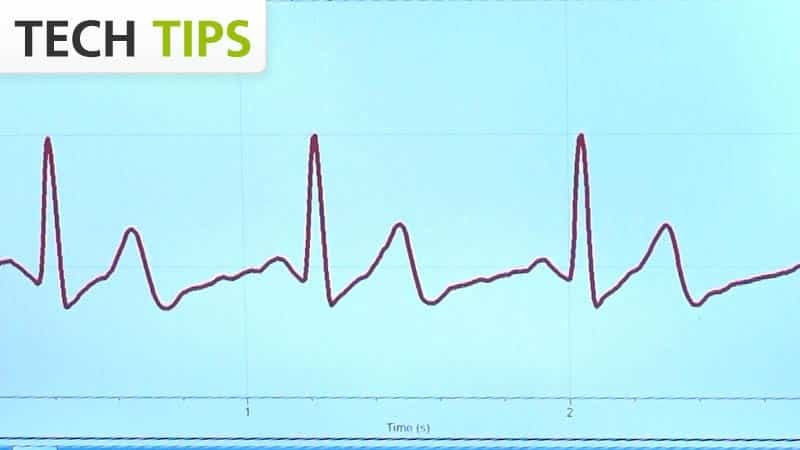 Determine the heart rate by examining the number of QRS waveforms over a period of time. The EKG Sensor may require a compatible interface and software. Choose a platform below to see compatible interface and software options. The EKG Sensor is fully supported with LabQuest 2 (version 2.8.5), a standalone data logger with built-in graphing and analysis software. This sensor will be automatically identified by Logger Pro or LabQuest 2 App. Use the following instructions for best results. To conduct EMGs, the red and green leads need to be placed on electrodes that are attached to the muscle of interest. The two leads are interchangeable for EMGs. Place two electrode tabs along the length of the muscle of interest. A third electrode tab should be placed above or below the nearest joint to serve as a ground. For example, to record from the muscles of the ventral forearm, attach three electrode tabs to the subject as shown in Figure 2. Two electrode tabs should be placed on the ventral forearm, 5 and 10 cm from the medial epicondyle with the ground electrode on the upper arm. Alternatively, the ground electrode can be placed on the wrist of the other arm to minimize movement artifacts. The green and red leads are connected to a high-gain differential amplifier in the sensor that has been optimized for measuring bioelectric signals. The high-gain amplifier circuit that measures bioelectric signals is electrically isolated from an output circuit that sends information to our software. Electrical isolation makes the device safe for human use. The electromyogram (EMG) is a graphic tracing of a muscle's electrical activity. The EMG is an extracellular surface recording of the action potentials that occur during a muscle contraction. Muscle cells are polarized at rest. This means the cells have slightly unequal concentrations of ions across their cell membranes. An excess of positive sodium ions on the outside of the membrane causes the outside of the membrane to have a positive charge relative to the inside of the membrane. The inside of the cell is at a potential of about 90 millivolts (mV) less than the outside of the cell membrane. The 90 mV difference is called the resting potential. The typical cell membrane is relatively impermeable to the entry of sodium. However, stimulation of a muscle cell causes an increase in its permeability to sodium. Sodium ions migrate into the cell through the opening of voltage-gated sodium channels. This causes a change (depolarization) in the electrical field around the cell. This change in cell potential from negative to positive and back is a voltage pulse called an action potential. In muscle cells, action potential triggers muscle contractions. Other ions and charged molecules are involved in the depolarization and repolarization of muscle. These include potassium, calcium, chlorine, and charged protein molecules. The sum action potential generated during the depolarization and repolarization of the cardiac muscle can be recorded by electrodes at the surface of the skin. A recording of the heart’s electrical activity is called an electrocardiogram (EKG). The cells of the heart’s conducting system depolarize spontaneously. This spontaneous depolarization is most apparent in a cluster of cardiac-muscle cells embedded in the upper wall of the right atrium. This group of cells is called the pacemaker (also known as the sinoatrial or SA node). Depolarization of the pacemaker generates a current that leads to the depolarization of all other cardiac-muscle cells. The wave of depolarization travels from the right atrium to the left atrium quickly enough that both atria contract at essentially the same time. The atria and the ventricles are isolated from each other electrically by connective tissue that acts like the insulation on an electric wire. The depolarization of the atria does not directly affect the ventricles. There is another group of cells in the right atrium, called the atrioventricular or AV node, which will conduct the depolarization of the atria down a special bundle of conducting fibers (called the Bundle of His) to the ventricles. In the muscle wall of the ventricles are Purkinje fibers, which are a special system of muscle fibers that bring depolarization to all parts of the ventricles almost simultaneously. This process causes a small time delay, so there is a short pause after the atria contract and before the ventricles contract. Because the cells of the heart muscle are interconnected, this wave of depolarization, contraction, and repolarization spreads across all of the connected muscle of the heart. When a portion of the heart is polarized and the adjacent portion is depolarized, an electrical current is created that moves through the body. This current is greatest when one half of the connected portion of the heart is polarized and the adjacent half is not polarized. The current decreases when the ratio of polarized tissue to non-polarized tissue is less than one to one. The changes in these currents can be measured, amplified, and plotted over time. The EKG represents the summation of all the action potentials from the heart, as detected on the surface of the body. It does not measure the mechanical contractions of the heart directly. The impulse originating at the SA node causes the atria to contract, forcing blood into the ventricles. Shortly after this contraction, the ventricles contract due to the signal conducted to them from the atria. The blood leaves the ventricles through the aorta and pulmonary artery. The polarity of the cardiac‑muscle cells returns to normal and the heart cycle starts again. The electrocardiogram (EKG) is a graphic tracing of the heart’s electrical activity. A typical tracing consists of a series of waveforms occurring in a repetitive order. These waveforms arise from a flat baseline called the isoelectric line. Any deflection from the isoelectric line denotes electrical activity. The five major deflections on a normal EKG are designated by the letters P, Q, R, S, and T. One heart cycle is represented by a group of waveforms beginning with the P wave, followed by the QRS wave complex, and ending with the T wave. T wave, and is usually represented by a positive deflection. The T wave indicates ventricular repolarization. Electrical energy is also generated by skeletal muscle, and can be seen as muscle artifacts if your arm is moved while the EKG is attached. The sequence from P wave to P wave represents one heart cycle. The number of cycles in a minute is called the heart rate and is typically 55–75 beats per minute at rest. If your EKG does not correspond to the above numbers, do not be alarmed. These numbers represent typical averages and many healthy hearts have data that fall outside of these parameters. To read an EKG effectively takes considerable training and skill. This sensor is not intended for medical diagnoses. You should never have to calibrate the EKG Sensor. Because you are primarily interested in the shape and periodicity of the signal, the EKG sensor does not need to be calibrated. The most common problem is a poor connection between the electrodes, skin, and/or clips. Allow the electrode tabs to stabilize with the skin of the subject for at least 2 minutes before recording. Verify that the clips are firmly attached to the tabs of the electrodes. Electrode tabs should be fresh and can be used only once. Dry, old, or used electrode tabs will be problematic. Make sure the subject does not move during the recording. For best results, make sure the subject is sitting when recording EKGs. 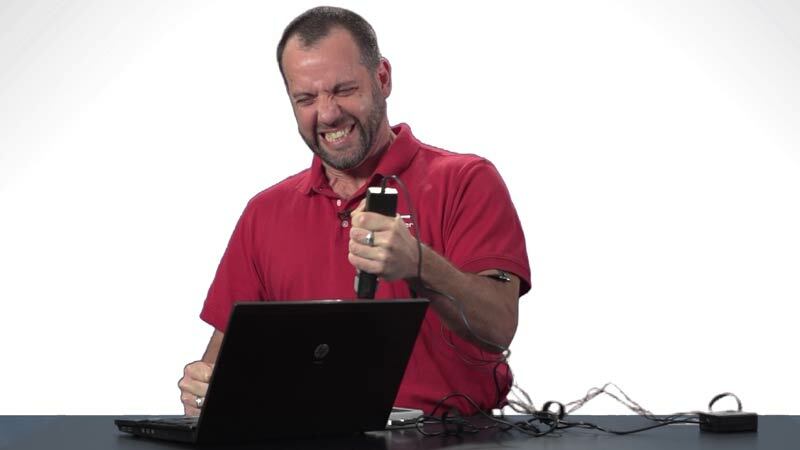 Try to limit sources of electrical noise that can interfere with recordings. Make sure that computers, computer monitors, electrical outlets, phones and/or other mobile devices are at least 1 foot away from the sensor and subject. Make sure that the device being used to collect data from the sensor is not plugged into an electrical outlet. A digital filter is automatically applied to data collected from the EKG Sensor. This filter is not ideal for recording EMGs. For best results when recording EMGs, select Potential as the Y-sxis of the graph before collecting data. This will display the unfiltered data from the sensor. 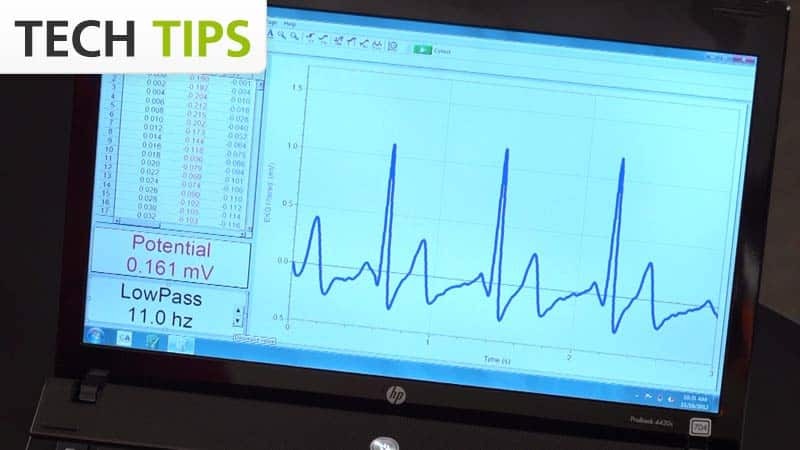 If you have watched the related product video(s), followed the troubleshooting steps, and are still having trouble with your EKG Sensor, contact Vernier Technical Support at support@vernier.com or call 888-837-6437. Support specialists will work with you to determine if the unit needs to be sent in for repair. At that time, a Return Merchandise Authorization (RMA) number will be issued and instructions will be communicated on how to return the unit for repair. Vernier warrants this product to be free from defects in materials and workmanship for a period of five years from the date of shipment to the customer. This warranty does not cover damage to the product caused by abuse or improper use.